Belmont Shore is a neighborhood in Long Beach, California. It is home to many shops, restaurants, salons and business offices. Livingston Drive and 2nd Street form the heart of Belmont Shore, from approximately Bluff Park on the west to Alamitos Bay and Naples Island on the east. The eastern border on Alamitos Bay Beach is an inland beach that faces Naples Island across a channel. 2nd Street and the fifteen intersecting side streets make up the business district of Belmont Shore. The neighborhood features Spanish-style homes from the 1920s and 1930s, older houses remodeled and expanded into contemporary styles, numerous large contemporary houses, and sections of multifamily apartment buildings. 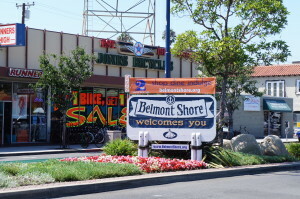 The business district is represented by the Belmont Shore Business Association (BSBA) and the residents are represented by the Belmont Shore Residents Association (BSRA). The southern coast of Belmont Shore is a south-facing Pacific Ocean beach that lies just inside the Long Beach breakwater. Due to the presence of the Federal breakwater, this beach experiences very little surf, and is not as popular for beach-going during the summer months as are the nearby beaches of Seal Beach or Huntington Beach, for example. The area offshore of the ocean beach is, however, popular with kitesurfers, kayakers, and boaters. The Leeway Sailing and Aquatics Center on Alamitos Bay in Belmont Shore is a youth sailing program founded in 1929 . The city claims it is one of the premier municipal instructional sailing programs in the country. The US Sailing Center is located on the Alamitos Bay Peninsula in Long Beach. The Sailing Center offers a wide range of programs for High School, College, and Olympic sailors in addition to programs for at-risk youth through local help groups, Learn-to-Sail classes for all ages and disabled sailing opportunities through the Sailing Center’s own Disabled Sailing Association. The Belmont Shore Car Show is the largest one-day annual car show held on the west coast. The car show is typically held in September. The Long Beach Sea Festival has ocean- and beach-related events in Belmont Shore. The festival was first staged 50 years ago with a handful of events. Currently, the Sea Festival offers around 100 events, ranging from sand castle building, to free Moonlight Movies on the Beach, to boat racing.